Breakfast at Kudat. Food are gud (and cheap sumore!). Pictures of the Kagayan Community in Maliangin Island. They are preparing the Pandanus-Mat for the exhibition in Yayasan Sabah next month. This is part of the community work that we have in Kudat, which is to improve their livelihood through alternative livelihoods (^_^). Our boat! nama dia "Mameng"
Pictures of me & Hermon (hermon is our intern attach to Kudat PCA). He will be staying in Maliangin Island for a few days to do reasearch on the Maliangin Mat processing. Siok tidur sana hammock, dikala angin bertiup sepoi-sepoi bahasa.. chewah! Banggi Environmental Awareness Centre (BEAC). Part of WWF-MY project as well. The community here are having the Kudat Open Water Course. Siok ni diorg kena ajar diving. FOC again dat. But it is only for 5 person from the community in Banggi la. A candid picture by Jane, me & salha waitting for our food. 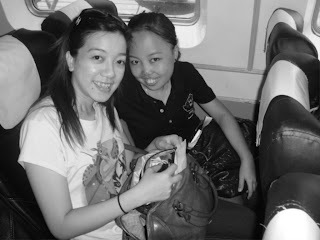 Me & jane dalam feri back to Kudat (from Kerakit)..